ArchEnemy by Frank Beddor. 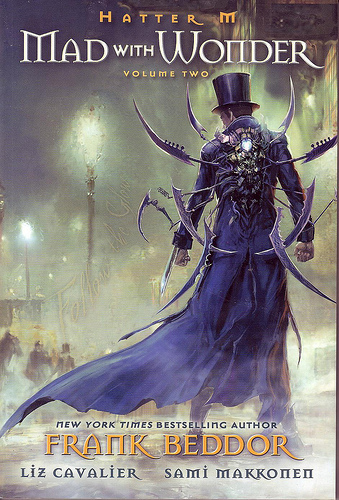 Cover art by Vance Kovacs. Third part of the Looking Glass Wars trilogy. Published by Dial Books (part of Penguin), 2009. Hardback first edition with dustjacket. The premise of the series is that the books as written by Lewis Carroll are a distortion of the ‘true events’. Alyss Heart (Alice Liddell) is actually the Princess of Wonderland: forced to flee to the real world when her sociopathic Aunt Redd takes over the throne. The white rabbit becomes Alyss’s (Alice’s) tutor, Bibwit Harte (an anagram), and the Mad Hatter is Hatter Madigan, the royal bodyguard. Discover the fate of Wonderland- and imagination itself- in this riveting conclusion to the New York Times bestselling trilogy. The Heart Crystal’s power has been depleted, and Imagination along with it. The people of Wonderland have all lost their creative drive, and most alarmingly, even Queen Alyss is without her powers. There is some comfort in the fact that the vicious Redd Heart seems to be similarly disabled. Amazingly, she is attempting to team up with her enemy, Alyss, in order to reclaim Wonderland from King Arch. Alyss might have no choice but to accept Redd’s overtures, especially when she begins to receive alarming advice from the caterpillar oracles. Hatter M Vol. 2: Mad With Wonder by Frank Beddor and Liz Cavalier. Automatic Pictures Publishing, 2009. Softback. 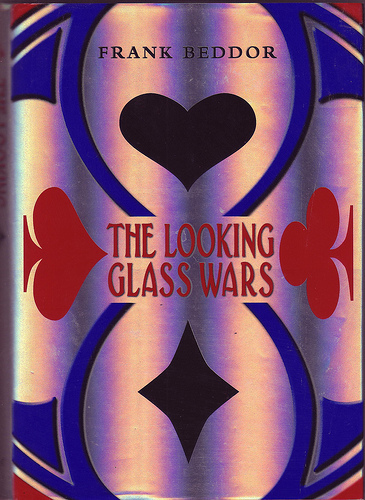 Graphic novel in the Looking Glass Wars series. It’s a mad, mad, mad world as Royal Bodyguard Hatter Madigan’s maniacal quest to find Alyss continues! In Volume 2, Mad With Wonder, Hatter follows the Glow from London to the battlefields of America’s Civil War in search of the Princess who must some day be Queen. The America that Hatter encounters is a sprawling, wounded, boiling landscape of innocence and energy run amok. The war is tearing the country apart, yet Hatter must maintain his sanity in this maelstrom of holy rollers, child healers, prophetic snake handlers, deranged outlaws, and passionate southern belles. As Hatter searches he learns he is not the only Wonderland presence that has found its way to the Promised Land. Queen Redd’s black imagination is fueling the Civil War and threatening our world with her evil! 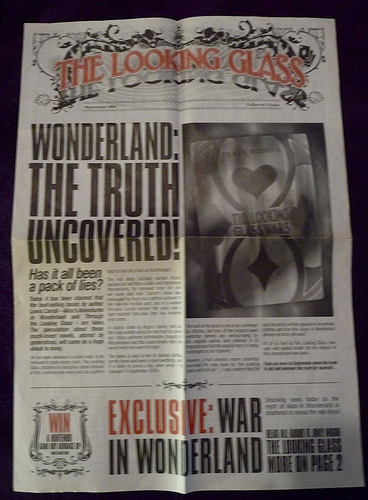 The Looking Glass: give-away newspaper advertising the release of Frank Beddor’s Looking Glass Wars in the UK. Published 2004 and given away in Borders. 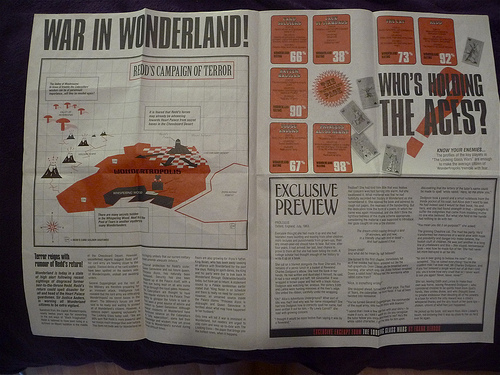 Single sheet folded in two to give a 4 page newspaper. Looking Glass Wars itself here. 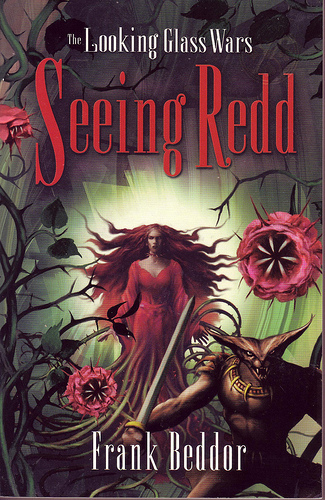 The Looking Glass Wars: Seeing Redd: by Frank Beddor. Published by Egmont Books Ltd, 2007. First edition in paperback. Second book in the Looking Glass Wars trilogy. Return to the dazzling world of The Looking Glass Wars as Wonderland is fantastically brought to life again by acclaimed Hollywood producer, Frank Beddor. Alyss of Wonderland’s rule has only just begun, but the Queendom and her White Imagination are already under threat. Someone has resurrected the brutal Glass Eyes, and they are attacking Wonderland on all sides. Has renegade Redd Heart freed herself and her assassin Cat from the prism of the Heart Crystal? 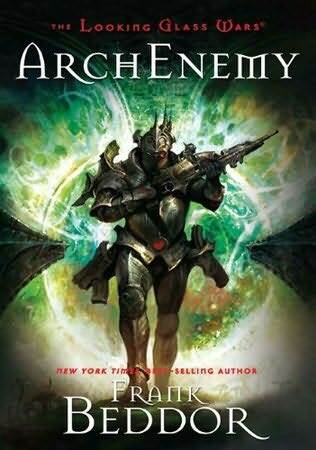 Can Alyss trust Boarderland’s King Arch, as he extends a benevolent helping hand? A battle is raging but who is the enemy? Frank Beddor is the CEO of Automatic Pictures, a film, television, and interactive game production company. He produced the hit film There’s Something About Mary. Frank Beddor hails from Minneapolis, and attended the University of Utah, where he trained for the U.S. Ski Team. One of the world’s foremost freestyle skiers, Beddor competed in the sport for five years, and was twice crowned World Champion. Trading the alpine slopes for the Hollywood Hills, Frank has worked alongside Emilio Estevez, Carrie Fisher, Chris Penn, Jennifer Tilly and Kevin Dillion. Frank Beddor lives in the U.S but is available for interviews. Looking Glass Wars website here. Published by Egmont, 2004. Hardback with dust jacket. Beddor apparently wrote this for boy’s after being forced to read the ‘girl’s book’ Alice as a child. It shows: I thought this was all violence and no characterisation. Beddor imagines that Alice’s wonderland did indeed exist. That it was not fairy tale. Princess Alyss Heart was heir to the throne of Wonderland, but was cruelly usurped when her Aunt Redd stormed Wondertropolis and murdered her parents. Fleeing for her life, Alyss was transported to our world, to the world of Charles Dodgson and literary Oxford in the late 19th Century. Taken in by the Liddells, Alyss at first steadfastly refused to denounce her true bearing as fiction. But after years of convincing nobody of her origins and noble birth–Alyss Heart became Alice Liddell. And it was Alice Liddell who inspired Dodgson to write his legendary novel about her–despite Alyss’s accusations that he has cruelly twisted her story to make light of her heritage for entertainment. Alyss’s Wonderland is an occupied land that must be freed. And Alyss eventually realises that she must once again go back to her true home and try to reclaim it. And it is going to be a bloody reckoning.